I'm writing this as I'm eating dinner, which is not something I normally do. But I think this is one of those recipes that a lot of you are going to like, and I'm feeling the need to share it with you now rather than later. It came together as I was riffing off one of Lora Zarubin's recipes from I Am Almost Always Hungry - her Potatoes with Tomato Curry. I love an all-in-one-pot meal, and was cobbling together a hearty, vegetarian version of her recipe with tempeh. It wasn't at all complicated, just an onion sautéed with a short list of spices, diced tomatoes, a splash of cream, and eventually potatoes and tempeh. It all came together in a vibrant red-orange pot of curry. Finished with a bit of cilantro, it's fragrant, filling, and tastes so much more indulgent than it actually is. A bit of an aside, I picked up Lora's book while browsing the cooking section at the library down the street from me the other day. I had a bit of a mini-celebration right there on the spot. I had this book years ago, and must have lost it or loaned it to someone. Anyhow, it was like running into an old friend, and I was happy to be reacquainted. 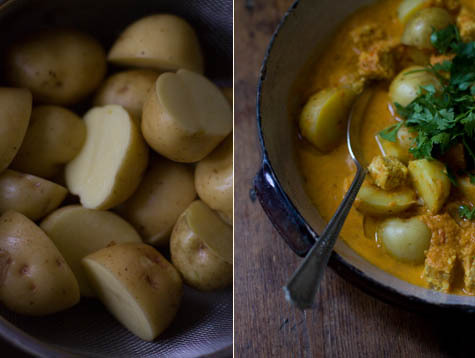 I should also mention, before we move on to the recipe, Lora's tomato and potato curry recipe is part of one of the most interesting Thanksgiving menus I've come across. Each time I read through it I promise myself I'm going to lobby my family to tackle it one year. There's plenty for a mixed crowd - vegetarians, vegans, the whole lot. The only dish inherently meat-centric is the turkey. Here's the menu: Roasted Turkey with Tandori Spices, Roasted Hubbard Squash Wedges with Garam Masala, Basmati Rice with Saffron and Cloves, Red Lentils with Tamarind and Dates, Potatoes with Tomato Curry, Creamed Spinach with Cardamom and Shiitake Duxelle, Steamed Brussels Sprouts with Ghee and Sea Salt, Cranberry and Ginger Chutney, Mint and Chile Raita, Clover Rolls with Rosemary, Pumpkin and Arborio Rice Pudding, and Shrikand (a creamy yogurt dessert) with Fresh Pomegranate Seeds. 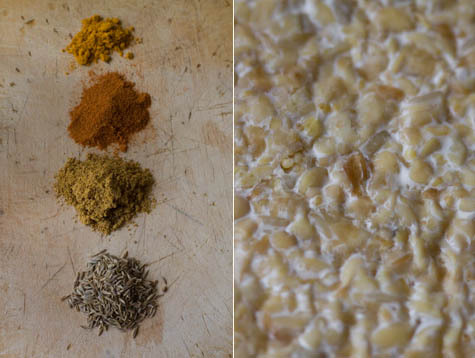 I hope you give the recipe a try, particularly those of you who aren't so sure about tempeh. I swear, it's just the thing to go along with the sun that has been setting early, and the colder nights as well. Have a glance at the head notes before you jump in though, there are a few things to consider before you start. I should also add, if you're in a pinch time-wise, cauliflower might be a perfect, quick-to-cook alternative to potatoes. This curry has a bit of kick to it - so if you're cooking for a spice-sensitive crowd, scale back a bit - and season to taste at the end. Also, the recipe has you steam the potatoes. I couldn't find my big metal steamer, so I rigged one using a metal strainer suspended over a large pasta pot with a lid on. There was a bit of a gap, and it probably took longer than it would have otherwise, but it worked. A pasta pot insert would work too. In the end, the potatoes just need to be cooked, so you could boil them or even roast them (oven at 375F) - both slightly different approaches, but fine workarounds. As far as the cooking fats go, if you like to cook with ghee or clarified butter, you can substitute that, or even coconut oil. Bring a few inches of water to boil in a large pot. Place the potatoes in a steamer (see head notes), sprinkle with 1 teaspoon of the salt and cook until tender throughout - about 20 - 30 minutes, depending on how large your potato pieces are. In the meantime, in a large skillet, melt the butter in the olive oil, add the onion and cook over LOW heat until they are soft, about 5 minutes. Stir in the cumin seeds, curry powder, turmeric, and cayenne pepper, wait about thirty seconds, then stir in the tomatoes, water, and the other teaspoon of salt. 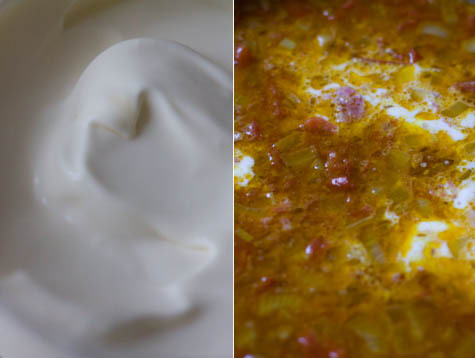 Remove from heat, stir in the cream and blend with a hand blender - (or leave it unpureed if you like!). Note: you might need to transfer it to a bowl to puree, then return it to the skillet. Once the curry is back in the pan, add the tempeh and bring barely to a simmer. Let the tempeh cook for 5 minutes or so, then add the potatoes when they are finished steaming. Transfer to a large family-style bowl, and sprinkle with cilantro before serving. This recipe was inspired by the Potato with Tomato Curry recipe in Lora Zarubin's I Am Almost Always Hungry. Published by Stewart, Tabori and Chang in 2003. Lunchbox magic - a post and video about taking one favorite tomato sauce, and working it into three different lunches.